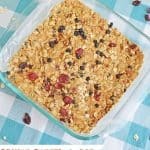 This No Bake Peanut Butter and Oatmeal Energy Bars Recipe is easy to make, filling and is a great addition to your list of healthy snacks for kids! 2 cups (cooled) toasted rolled oats (lightly toasted in a dry nonstick skillet over medium-high heat on your stovetop, stirring occasionally, for about 5 minutes or until they are golden brown. Lightly coat parchment with cooking spray. Add peanut butter and maple syrup to a large bowl, cover, and heat in the microwave for about 2 minutes, stirring at the halfway mark until they are thoroughly melted and mixed together. Spread mixture into pan and press firmly.